Jews pray in synagogue built after Second Temple's destruction, enjoying security provided by the IDF's Judea Brigade. 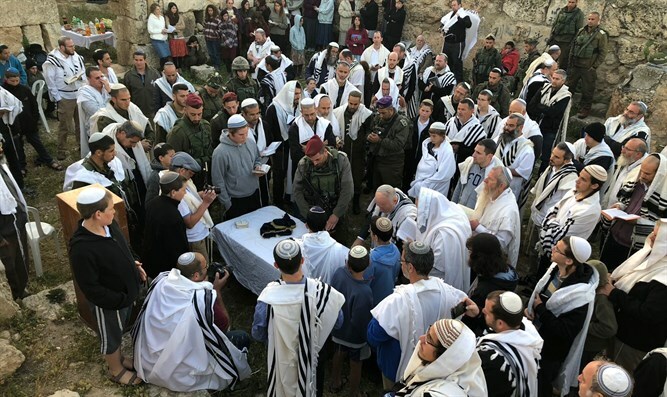 IDF soldiers joined those saying the morning prayers at the ancient synagogue in Eshtemoa (called as-Samu by Arab villagers, an instance of how Hebrew roots of place names are an indication of prior Jewish residence, ed.) on Wednesday morning. The al-Samu synagogue, also known by its Biblical name of "Eshtemoa," dates back to just after the Second Temple Period, when large Jewish communities left Jerusalem after the destruction of the Temple to settle in Har Hevron. Remains of candelabras, as well as reliefs of the Temple Menorah, have been found at the site. The prayers were organized by the Mount Hevron Regional Council and the IDF's Judea Brigade. Attending were Mount Hevron Regional Council Head Yochai Demeri and Judea Regional Brigade Commander Itzik Cohen. Dr. Doron Sar Avi, a Susya resident and the Director of the Land of Israel Studies Department at Herzog College, told participants that most of the candelabras in the Israel Museum are from Mount Hevron. The local Jews chose the menorah (candelabra) as their symbol, which they engraved on the doorposts of homes and synagogues. Many of the remains have been preserved. Excavations at the site uncovered mosaics with Hebrew writing, similar to those found in a synagogue in neighboring Susya. "This morning, we merited to participate in an emotional event - mass prayers and singing Hallel (songs of praise said on festivals)," Demeri said. "Thousands of years after the local Jews abandoned this site, we once again hear the voice of prayer and song." "This is a special place, whose roots are deep in the Second Temple. It gives legitimacy to the Jewish communities in this area. I thank all those who participated in the festive prayers, as well as the Judea Brigade, its commanders, and its dear soldiers, for this opportunity and the security [they provided]." Cohen said, "I wish all the residents and guests a happy Pesach (Passover). Go on trips, and enjoy to the fullest your security and quality of life."